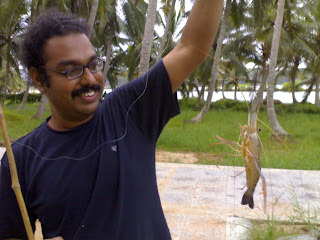 Just bagged a Tiger Prawn (Penaeus monodon) in the lake. I had brought out the fishing rods on impulse while taking quick break for a cup of coffee. I did not expect to catch anything but life it seems to be full of surprises. The nasty bugger snipped at my fingers while I was trying to free him of the tiny fishing hook. I know why its called a Tiger Prawn now. Hai,Though you are sensitive to sea food,It[Tiger prawn],caught you.That'sLIFE!No chance for YOU,Whether you like it or not,THINGS go on moving.....Congrats!for good catch!